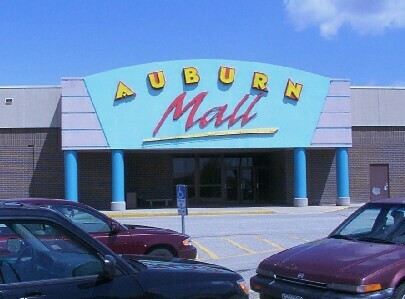 The Auburn Mall officially opened on Aug. 7, 1979. It's a one-level regional mall that can hold up to 58 stores. The area where it is located then became the retail district of the Auburn/Lewiston area. The Lewiston Mall had Sears and Zayre but it was rather small with only a few small tenants. The original 50 stores at the Auburn Mall included Deb Shops, Foxmoor, Kinney Shoes, Thom McAn, Spencer Gifts, Bookland, Fanny Farmer, CVS, Hickory Farms, General Nutrition, Waldenbooks, Radio Shack, Regis Hairstylist and Papa Gino's. The two anchor stores were JC Penney and Porteous. The mall did quite well over the years, being the only true indoor mall in the region. A Kmart store was located nearby but in 1991, the Auburn Plaza opened near it and added Rich's and Service Merchandise to Auburn. In 1992, the mall got a facelift with a modern theme, but that theme would become outdated in a few years. It is one of the things that makes that mall unattractive today. In the mid 1990's, Wal-Mart and Home Depot opened near the mall begining a new trend in shopping patterns. The mall started to suffer, stores like Famous Footwear closed. In 2001, CVS closed it's store at the mall. The bank in the parking lot is now vacant too for a total of 24 vacancies.